The Victorians looked at the world much differently than we do today. They were the first culture on a large scale to make the transition from an agrarian life style to an industrial life style. Of course, their views were the product of centuries of thinking and writing, religion and morals with a strong mix of the exciting new concepts in science and large scale economic development. They attempted to understand their environment in a different way. Sometimes we find oddities (by our standards). Gradually I will be adding to this category. Obviously children have been nursed by their mothers since the beginning. Some cultures have had 'wet nurses' in which the job of nursing was delegated to a servant. Then our culture dropped the concept of nursing almost completely for a generation as most American mothers went to bottle feeding of infants. Of course there was a backlash to that trend and La Leche League has again made it ok to nurse children and many states have made it legal to do so in public. In the meantime, cultures around the world have adopted the bottle feeding program. After considerable research, I have been able to discover that in France, foundling (orphan) babies were often fed using goats. In addition the practice was also used in some parts of Africa. People used to think that the characteristics of the animal might change the baby's characteristics and some religions banned the practice. This enamel tipped sterling 5.5" tea sized spoon (manufactured by Shepard Mfg. Co. of Massachusetts ) purportedly comes from Cuba (Havana) and in the bowl there is a detailed engraved picture of a mother holding her baby under a goat as the baby nurses directly from the goat's teats. 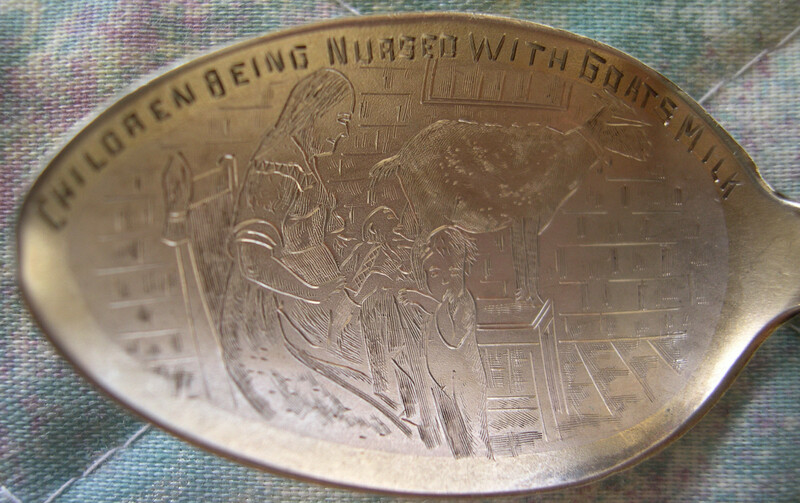 "children being nursed with goats milk"
I was able to find this picture from Cuba, 1903 and the spoon appears to be based upon this picture. I have no information as to why someone chose to enngrave this picture in a spoon bowl. If you have any other examples of Victorian oddity spoons, please contact me.